Is the 8-quart Instant Pot ever TOO BIG? …asked Don S. after watching some of my past #AskWardee videos on the Instant Pot, where I share that my favorite size is the 8 quart. The Question: Is The 8-Quart Instant Pot Ever Too Big? Great info regarding Instant Pot. Thank you. Was there ever a situation when you felt the 8qt Instant Pot was TOO large to produce the food quality you wanted, or it cooked inefficiently or improperly? Example: when only making 4 quarts of yogurt, or when preparing a small quantity of food. Always nice to have the bigger capacity if needed (especially for canning), as long as it doesn't negatively affect in other ways. Agree with you about the Duo being an all-around suitable model. Thank you. Don, such a great question! Thank you for asking it! For awhile, I had a 6-quart Instant Pot along with our two 8-quart Instant Pots. Have I missed having the 6-quart Instant Pot since then? Not at all. You mentioned a specific example of doing a smaller quantity of yogurt, like 4 quarts. It is no trouble to do just a couple quarts of yogurt in a larger Instant Pot like the 8-quart DUO. Smaller quantities of foods in stackable pans*, Pyrex bowls, or steamer baskets actually do better in the larger Instant Pot than the smaller. Everything fits better and comes out more easily, etc. *Use code 10OFF4WARDEE to get 10% OFF from seller Me'n'Lily. When you're sauteing or melting small quantities (like we do salves and such like this)…. it's no difference using the 8-quart Instant Pot. It works just as well. The size is just fine, and I've never felt it cooked inefficiently or improperly, even with small amounts of food, whether that's rice, beans, yogurt, hard-boiled eggs, or anything else. As you know, when cooking under pressure, there is a minimum liquid requirement. 18 fluid ounces is about 2.25 cups. So as long as you have that much liquid in there, you can safely pressure cook any amount of food, large or small. If you're not pressure cooking, you don't have to follow the minimum liquid rule. And please keep in mind that because of the extra space, it may take a little longer to pressurize. I have never found this extra time to be significant. And it's the case whether or not you have large or small quantities of food inside. Don, you said: “Always nice to have the bigger capacity if needed (especially for canning)” and I want to be sure to clarify that we do NOT recommend the Instant Pot be used for canning. You see, we err on the side of caution when it comes to pressure canning. According to the National Center for Home Food Preservation, there is no ‘electric' pressure cooker/canner that's safe for home canning. Additionally, because the pressure cooker is regulated by a pressure sensor instead of a thermometer, the actual temperature may change based on the elevation of your location. Therefore it may not achieve a high enough temperature to can food safely. With both of these things in mind, we cannot and do NOT recommend anyone use the Instant Pot for home pressure canning. In case you don't know, the Instant Pot is an electric appliance that allows you to pressure cook, slow cook, saute, and much more! We love it! 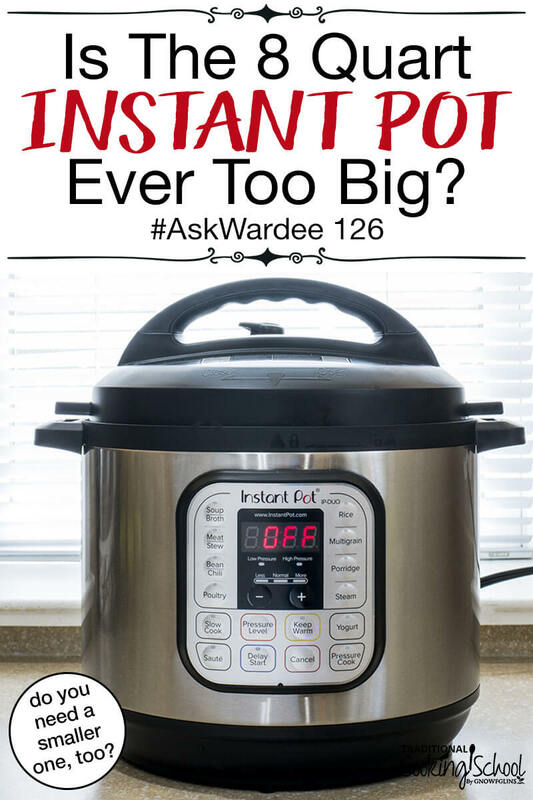 Check out my previous #AskWardee: Which Instant Pot Should I Buy? Which Size And Model Is Best For My Family? And if you haven't already, download our FREE recipe: Instant Pot Sourdough Cornbread. It's sooo yummy, healthy, and easy! We also have extensive archives of Instant Pot recipes here! If you have other questions or comments about your own experience with the 8-quart Instant Pot, be sure to leave them in the comments! #AskWardee 048: Which Instant Pot Should I Buy? Which Size And Model Is Best For My Family? Stackable pans — Use code 10OFF4WARDEE to get 10% OFF from seller Me'n'Lily. Do you have an 8-quart Instant Pot? Do you ever feel it's too big?